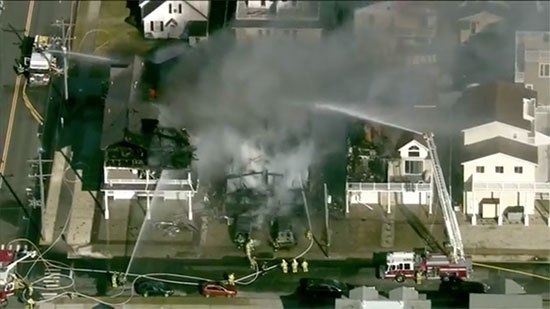 The body of an elderly woman has been found after a massive fire destroyed several homes in Sea Isle City on Thursday, 11/29. 89-year-old Marie Zielinski's body was recovered from her apartment. Two others, 56-year-old Elizabeth Coleman and 60-year-old Roy Lombardo, were injured in the blaze and taken to Cape Regional Medical Center. Lombardo has been treated and released, but Coleman has been transferred to Cooper University Medical Center. The fire started around 11:30 a.m. on 54th street near Landis Avenue. Three buildings, each with two units, were destroyed. The cause of the fire is still under investigation. Police in Cherry Hill, NJ, have announced upgraded charges against two women in a violent altercation in a Wawa store earlier this month. 19-year-old Destiny Davis was charged with aggravated assault and 18-year-old Diamond Howard was charged with simple assault. The pair were previously given summonses for disorderly conduct and fined $200, but video of the incident recently surfaced showing the disturbing event. It happened on November 17th in the convenience store on Route 38. The victim was spat on, knocked to the ground, and punched repeatedly in the head after the older woman asked the two younger women to refrain from using profanity while waiting in line at the register. Watch Video of Cherry Hill Wawa Attack. Amtrak announced on Friday that the iconic Solari flipping board that displays the train schedules at Philadelphia's 30th Street Station will be removed in January. The familiar clacking sounds associated with updating arrivals and departures will be silenced. A brand new Passenger Information Display System (PIDS) will be installed in December. It is part of an overall modernization plan at the station. The Solari board runs on Windows 95 and is increasingly harder to maintain. Displays in the ClubAcela Lounge, food court, and other areas will also be upgraded, including the public address system. It will all be ADA compliant. The old board will go on display at The Railroad Museum of Pennsylvania in Strasburg, PA, in Lancaster County. A Boil Water Advisory remains in effect through at least the weekend for residents in parts of Lower Bucks County. 12,600 Pennsylvania American Water customers in Yardley, Lower Makefield and parts of Falls Township are effected. Pennsylvania American advises customers to boil water for at least 1 minute before using for cooking or drinking. They first issued the alert on Thursday, 11/29, after routine tests showed high levels of turbidity, or cloudiness, in the water caused by a problems in the filtration system at the plant. "Because of these high levels of turbidity, there is an increased chance that the water might contain disease-causing organisms," officials said. Pennsbury School District was closed for the day because of the advisory. Clean water tankers are posted at these locations. There is no timetable for when it will be lifted.